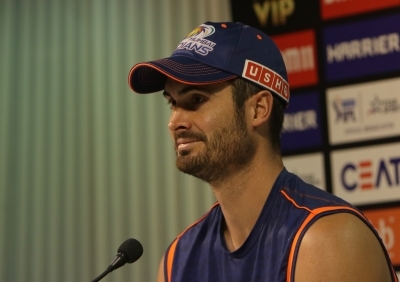 New Delhi, April 17 (IANS) Mumbai Indians (MI) will take on Delhi Capitals (DC) on a low and slow Feroz Shah Kotla wicket on Thursday and with the home team also finding it difficult to adapt to the conditions, MI all-rounder Ben Cutting said it always helps when the away team starts on the same page as the home side. "It helps if the home team doesn't have the advantage. We start even in that case. We have played against all the teams except Kolkata Knight Riders and I think we are aware of what to expect from Delhi. We have kept a close eye on how they play," he pointed out on the eve of their clash against Delhi. Asked how MI are looking to approach the away games after playing quite a few matches at home, Cutting said: "Pretty much how we approached the other games. We play four straight games on the road and the wickets will be fairly different. We will look to adapt to the conditions." MI skipper Rohit Sharma, all-rounder Hardik Pandya and pacer Jasprit Bumrah have all been named in India's World Cup squad. Asked if that will help the players focus more on the Indian Premier League (IPL) now, the all-rounder said the focus anyway was on this tournament. "The World Cup is starting in a couple of months time. Right now it is important to focus on the IPL. You have to play freely and that is how it is in T20 cricket and I don't think there is any other way," he opined. Asked if there have been any talks on workload management, Cutting said: "The bowling coaches can say that. It isn't something that we can speak about."